As with all our departments, our plating lines are under strict laboratory control. 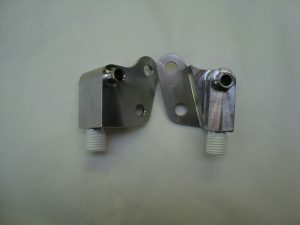 We are plate Silver, lead and Indium.To complement these services, masking facilities control plating for tight tolerances, stress relieving and de-embrittlement are available as is the ability to apply all our plating processes to stainless and alloy steel components for which we also offer passivation to those areas do not require plating. Lead coatings on big end and other similar bearings has been used extensively for many years, used now mainly for overhaul and repair of older engines, pure lead is deposited on to the bronze bearing bush, not only is the lead highly lubricative and slow wearing, but because it is very soft and the coating is relatively thick, around 0.005”/0.010” it absorbs and captures the minute metal particles worn from other parts of the engine preventing them from abrading other parts of the engine, this extends engine life dramatically. Unfortunately in this type of application Lead readily oxidises and wears away, to prevent this, a thin film of pure Indium is plated on top of the lead and the two metals are “fused” together by soaking in a near boiling oil bath. This fusion forms a lead indium alloy which does not oxidise, thereby lasting for many years. Silver, like lead, also has excellent lubrication and anti galling properties. Ashton & Moore offer deposits of pure silver without the addition of the brightening agents used for decorative purposes, such as table wear and jewellery. The even white matt coating produced is used extensively in high performance applications to prevent assemblies of similar materials from “welding” together thus allowing easy disassembly for servicing. Silver is particularly effective where threaded stainless steel components are assembled together in high temperature applications. As one of the few companies still licenced to provide this process Ashton and Moore Ltd. is capable of offering it as an extremely good corrosion inhibiting coating with a “sacrificial benefit” that allows it to continue working, even when scratched. Though these days it is limited by law to use only on aerospace products and some safety critical applications. 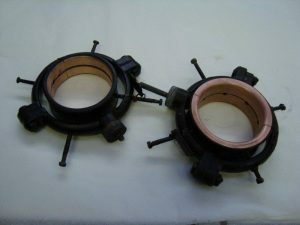 As well as being conductive the cadmium plating has predictable torque characteristics, good lubricity and works well as either a final finish, or as a base for painting. It is usually passivated after application and any subsequent de-embrittlement to enhance its protective capabilities. Exacting engineering requirements now require that specific areas of components should not be coated. Although masking for anodising is particularly challenging, Ashton & Moore has developed their own range of masking media to meet the most demanding requirements. When combined with the use of bungs and pre-cut masking media, etc. this permits us to achieve remarkably intricate, accurate and repeatable results on a production scale.